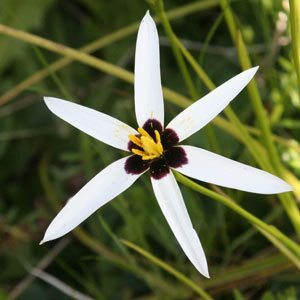 Spiloxene are an interesting bulb native to South Africa, the flowers will open only on sunny afternoons so they really do need sun. Large flowers on tall stems in spring these bulbs grow well in a Mediterranean climate. Look for Spiloxene capensis (see image right) is perhaps the most widely grown flowers are open with six petals, ranging from white through to pink mostly with contrasting darker centre. Spiloxene serrata with its white to yellow flowers is attractive and S. minuta is a dwarf species very rare in cultivation. Easy care, they require a dry summer after flowering, they do prefer a moist to damp humus rich from autumn. Plenty of sun. They can successfully be grown in a container given the right conditions.